In the independence struggle in Palestine, which culminated in November 1947 with the founding of the State of Israel, a number of Jewish organizations played important military roles, although they did not always act in concert. The largest of these was the thirty-thousand-strong Haganah, conceived not as a guerrilla force but as a broadly based self-protection umbrella for Jews in Palestine, which followed a policy of self-restraint and nonviolence. It acted as the parent body for the Palmach (from Plugot Mahatz or “shock troops”), which had been formed in May 1941, with the knowledge of the British who administered the Palestine mandate. The Palmach fielded approximately four thousand members, of whom 15 to 20 percent were women. The Haganah ensured that the women in the Palmach received weapons and combat training alongside the men. Female members of the Palmach played a relatively minor role in the organization’s so-called actions against the British in Palestine—the sabotaging of communications and attacks on British army bases—and in 1946 the organization renounced terrorism and turned its attention to nonviolent activities, for example, encouraging and aiding the arrival in Palestine of illegal Jewish immigrants. There were two more militant armed Jewish organizations: Etzel, with a membership of some seven thousand; and a smaller, splinter faction, Lehi, a self-proclaimed terror group dedicated to the violent ending of the British mandate in Palestine. Lehi fielded about eight hundred fighters and often clashed bitterly with the Haganah. Along with Etzel, it used women as medics and messengers and, in common with World War II Resistance networks, employed women to smuggle ammunition and explosives. A celebrated member of Lehi was Geula Cohen, an announcer on its underground radio station, the Voice of Fighting Zion, who was famous for her lugubrious tones as she issued chilling threats to the British forces occupying Palestine. Cohen was later to pursue a political career and in the early 1990s became a junior minister in the government headed by Yitzhak Shamir, who had been a driving force behind Lehi in the 1940s. On the day the United Nations voted in favor of the establishment of a Jewish state, November 29, 1947, a mixed-gender Haganah patrol in the Negev was ambushed by Bedouins and wiped out. Their dead bodies were then mutilated, which prompted an order from Haganah headquarters withdrawing women from combat units. However, in the Israeli War of Independence, which broke out in early 1948 as the British relinquished their mandate in Palestine, women played an active part in the fighting that flared as the fledgling state was assailed by its Arab neighbors. Some women served as escorts to convoys making their way to a besieged Jerusalem. The women were also responsible for concealed arms and ammunition, confident that British troops would not search them. A number of women also took part in Operation Nachshon, Israel’s brigade-sized operations in the hill country to the west of Jerusalem. Among them was twenty-year-old Netiva Ben-Yehuda, who had joined the Palmach in 1946 and served in an engineer unit. More than thirty years later, she recounted her experiences in the War of Independence in three autobiographical novels. In June 1948 the United Nations brokered a truce between Israel and its Arab enemies. This enabled the newly formed Israeli Defense Forces (IDF) to rest and regroup while they were reorganized and underwent intensive training as war matériel arrived from Europe. The IDF then decided to remove women from the front line. Some 10,600 women continued to serve throughout the war, which ended in July 1949, but they were tasked with medical and administrative duties in a Women’s Corps whose members served in female battalions attached to but independent of male formations. In 1949 the Women’s Corps was restructured and women soldiers were dispersed among male units. Thereafter one of its roles was to act as a support system for the women in the IDF’s ranks. The Defense Service Law had required all citizens and permanent residents of Israel to perform military service. All women between the ages of eighteen and twenty-six who were physically fit, unmarried, and had not borne children, and had not objected on grounds of religion or conscience, were obliged to fulfill their military obligation. But in 2003, during the hearing that imprisoned five young men for refusing to serve on the “political” grounds of opposing the Israeli occupation of territory annexed after the Six Day War of 1967, the court reinterpreted the exemption law for women. Thereafter women were obliged to go through the same channels as men to gain exemption, which remains at the discretion of the minister of defense. Until recent years, conscript women in the IDF were largely confined to administrative duties. If they possessed the right qualifications and had the endorsement of their commander, they could attend officer school. However, after graduation they could only command other women. Those who chose to remain in the IDF faced a limited range of promotion prospects and could not command men. Israel is a small country that since its formation has often been obliged simultaneously to confront a range of more populous enemies on its borders. In time of war it relies on the rapid mobilization of its reserve to meet any major threat. In 1973, for example, just before the outbreak of the Yom Kippur War, the active IDF numbered some 75,000, of whom one-third were regulars in the army, navy, and air force, with the balance supplied by on-duty reservists and conscripts undergoing training. On mobilization in October, Israel’s armed forces grew to 350,000. 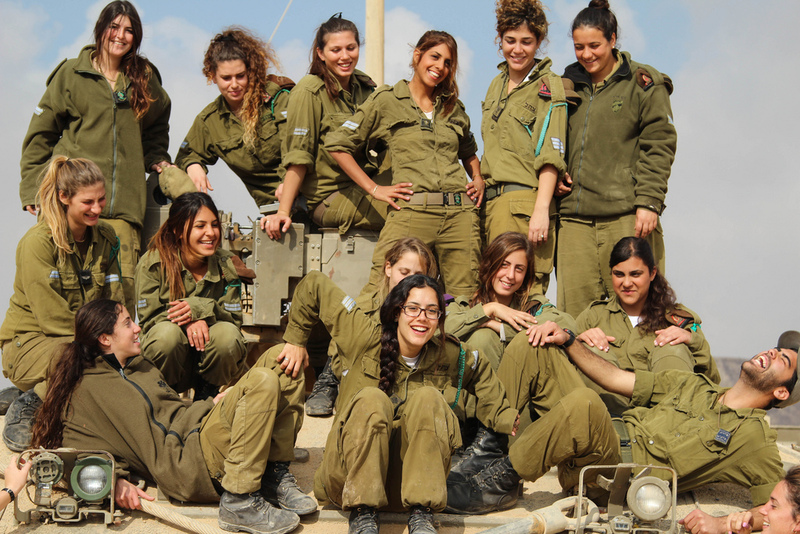 Women, however, rarely serve in the IDF reserve. Nevertheless, since the 1990s women in the IDF have been making some, albeit limited, progress. This is a phenomenon that some military historians who are skeptical about the role of women in modern armies have linked to several interrelated factors. One of the most significant of these is the growing reluctance, since Israel’s invasion of Lebanon in 1982, of a small but statistically significant number of Israeli men to undertake military service. Some of the gaps this has opened up have been filled by the introduction of women into a number of military occupational specialties (MOS) that had previously been the preserve of men. Following a 1995 ruling of the Israeli Supreme Court, which upheld an appeal by Alice Miller, a Jewish immigrant from South Africa, women became eligible for training as aircrew in the Israeli air force. Miller did not make it through pilot training, but in 2001 Lieutenant Roni Zuckerman became the fourth Israeli woman to complete the air force’s flight course and the first to reach the status of F-16 fighter pilot, ranking sixth in a class of seventy. Previously, several women had qualified as navigators. From 1997, women in the IDF have joined antiaircraft units, and in 1998 the navy removed its barriers to the recruitment of female shipboard personnel, although women do not serve in submarines. By 2005, women were able to serve in 83 percent of the MOS in the IDF. Combat, however, remains voluntary. Those women who volunteer for combat duty are among the small number of female personnel required to undertake active reserve duty, and this for only a period of two years after their active service. Currently some five hundred women serve in combat units of Israel’s security forces, principally the border police. These volunteers may be required to serve for three years because they must undergo lengthy training. However, women still have a long way to go in the IDF. In 2002 some 33 percent of the IDF’s junior officers were female, a percentage that fell to 21 percent in the case of middle-ranking officers (majors and captains) and plummeted to only 3 percent in the senior ranks. Significantly, as women have become integrated more fully into the structures and operations of the IDF the number of exemptions from service for women—principally for religious reasons—has risen. It remains to be seen if the aftermath of Israel’s invasion of southern Lebanon in July 2006 effects long-term changes in IDF morale and composition. The bottom photo are not IDF women. They are policewomen.